Drywall manufacturers are definitely on the rise. Since drywall seems hard to beat thanks to a wide range of advantages such as low cost, this modern alternative to old good wall plaster has become the most popular material that is used for construction. It is produced primarily of gypsum – a soft mineral containing large amounts of water. This chemical property allows drywall to provide a certain measure of fire protection. The thing about drywall is that gypsum gets sandwiched between two layers of heavy paper which helps to prevent the board from breaking. However, plasterboards are composed not only of gypsum: even though manufacturers balance between 70 to 95% gypsum, cellulose and additional substances may comprise up to 30% of the material’s composition. In spite of having fire-resistant properties, the paper content makes it difficult to refer to drywall as to ‘100% fireproof’, though. To put it simply, drywall is needed everywhere. Being an essential material for either remodeling or construction, it is applied in interior walls – if you look around, you’d notice that most commercial establishments use gypsum boards. In recent years, it has been widely used for home décor, too, owing to its sound absorbing properties and fire retardancy. It’s so prevalent and even, to some extent, indispensable but there’s a reason for that: drywall is extremely easy to install. Even if it gets damaged, you’ll be able to repair the thing quite quickly. You can also fix any wall you want before painting it to get a smooth finish. Besides, the material’s structure allows to create unusual (read: curved) shapes that is especially important when decoration comes into play – drywall can add some interesting textures to your place. Regular, usually used in areas with humidity level less than 70%. Its thickness may vary from ¼ to ¾ inches. Fire-resistant, also known as ‘Type X’. Manufacturing involves placing fiberglass strands, vermiculite, boric acid and perlite into a gypsum core. It prevents all layers from possible damage and allows a gypsum core to withstand high temperatures longer. Moisture-resistant, has a special structure, also contains silicone oil in its layers. This material is produced for damp areas with humidity index of 82-85%. Should not be exposed to water for more than 10 hours per day. Blue, moisture and mold resistant drywall combining all specifications of the abovementioned construction materials. Has blue absorptive paper that provides good plaster bond. Vinyl-covered, regular boards covered with a layer of decorative paper. V-Cut flexible, designed for curved applications, allows to install curved walls or ceilings. Perforated, ideal for decorative installations, has various square or round hole patterns to provide high acoustical absorption. Green, moisture-resistant drywall, contains an oil-based agent added into green-colored paper to provide moisture resistance. Cement board, has a higher level of water resistance compared to greenboard, often used in sauna rooms, showers. Soundproof, expensive but effective, creates a sound barrier. One layer of soundproof board can be equivalent to 8-10 layers of conventional plasterboard. Soundboard, has a lower class of sound transmission than soundproof drywall, usually used in conjunction with regulars or soundproofs. Enviroboard, produced from recycled agricultural waste. Lead-lined, a means for optimal radiation shielding, used in premises like treatment rooms where occupants run the risk to be exposed to x-rays or gamma-rays. EcoRock, environmentally friendly drywall, composed of around 20 recycled materials such as slag, fly ash, fillers and kiln dust. Foil-backed, a vapor retarder, designed to prevent condensation within the wall cavity. Controlled density (CD), available in 1/2″ thickness only, has stiffer structure than regular panels. Firecode C, close to Type X panels in structure. The only difference is that Firecode C contains more glass fiber and a special type of vermiculite that prevents the board from shrinking. Thus turns out to be more resistant to fire than any other plasterboard. Drywall panels are industrially manufactured according to size standards. Depending on the size, panels vary in their prices and production costs. Though there are international size charts setting a standard for each type, some countries produce wider or thicker boards varying in length. USA and Canada. Width of drywall sheets in these countries may be as follows: 2, 3, 4, 4,25, 4,5, 8 ft. Common length is 8 ft. but sheets are commonly available up to 16. As for thickness, there are ¼, 3/8, ½ and 5/8-inch wallboards. Europe. Gypsum boards width may vary from 60 to 120 cm, these are usually made in 240 cm length, but longer plasterboards are also available, up to 300 cm. Thickness can range from 9.5 mm to 25 mm. Australia and New Zealand. The standard width for these countries is 1200 mm, with the length including options 2400, 4800 and 6000 mm long. The thickness is also measured in the metric system and can be 10, 13, 16, and 25 mm. On the whole, gypsum business is gradually growing over recent years. The number one reason why the market continues to develop is a tendency among manufacturers to pursue aggressive pricing strategies. Regardless of what substitutes are offered, gypsum building blocks remain one of the cheapest materials available, and in comparison to their direct competitors – plywood, wooden panels or hardboard which tend to cause depletion of forest ecosystems – low-cost drywall improves overall ecological situation mostly because components used in the production can be easily recycled. So it goes without saying that gypsum plasterboards has a great market potential and might be quite a lucrative investment opportunity for vendors. If you want to become ‘a gypsum entrepreneur’, first you will need to apply for various certificates and registrations – always check your state’s law before delving in the business. Right when the paper work is done, it is time to set up the machinery: production line, testing gear, hand tools, tables etc. The better your manufacturing equipment, the better products will roll off the line, so you should think about these details in advance. 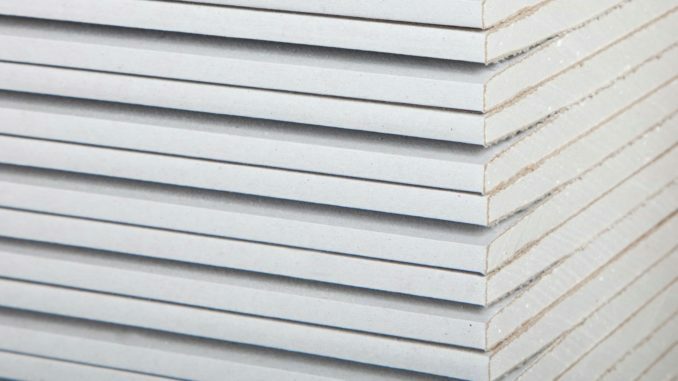 As for raw materials, two important compounds of any plasterboard are heavy paper sheets and gypsum powder. And do not forget that you always have to meet the standards or criteria of the state. That’s the key. Small-scale production lines are of special interest because this is a powerful piece of equipment to start your own business. These manufacturing units have high production capacity and can produce up to 240 yd of gypsum boards per year. Speaking in equivalents, these metrics match 200 drywall panels per average working shift. Small-scale lines cost at a slightly lower figure than heavy machinery: approximately $150,000. The price, though, depends on characteristics and features coming within the machine. In addition, your industrial premises have to meet fundamental requirements. The facility area must not be less than 785 yd³ while the temperature must not be lower than 15°С. Wallboard manufacturing facilities ought to maintain safe working environment for employees and, what’s more important, you should have enough supplies to keep going. The main ‘element’ for drywall production is natural or synthetic gypsum. There are a few other materials that you will have to take care of: paper sheets, dry additives. But gypsum and plaster of Paris are your principal raw materials whereas others come more as modifiers to produce different types of plasterboards. Some manufacturers use recycled chemicals to improve the product quality: these are borogypsum and phosphogypsum. Slurry additives are also worth mentioning: these are pulpwood, sodium chloride and sodium hydroxide. Besides, you will have to buy casein used in drywall fillers. 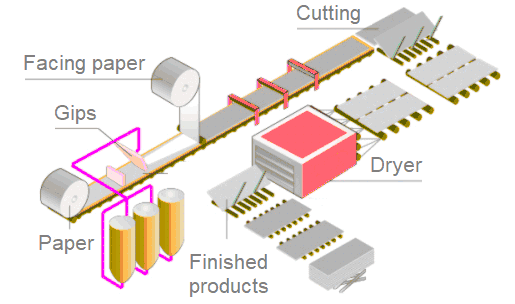 Manufacturing can be divided into several primary stages. Gypsum occurs underground, so the whole process starts with mining. But do not think that you’ll be supposed to source deposits of gypsum all over the country – there’s an option to buy materials from ‘gypsum retailers’. As long as most gypsum is harvested from quarries, manufacturers try to locate their factories close to these mines to avoid shipping expenses and to save money. Surprisingly, but this all is done within one production line. Gypsum rocks are crushed to turn it into a powder which is then mixed with other minerals, water, soap foam and starch. Once the mixture forms a thick paste, it is placed in a special tube with accelerators so that the material could set faster. That is the way of getting the primary material called a slurry which then goes onto the board forming line. Then it is time to make the sandwich. The slurry is poured onto a sheet of paper that moves along a board machine and then another layer unrolls on top of the slurry. This sandwich travels through special rollers compacting the core to the right thickness. That’s why everyone says that gypsum ‘is sandwiched between two paper sheets – this is literally the process of making drywall. By the way, most of processes are automatic – everything is done by calibrated machines without any handmade. The final stage before cutting the panels is finishing the edges – another automated line forms the edges of some shape (there are various options). Now the product actually looks like two endless flat stripes. Right after these sheets harden a little and edges get shaped, they continue their journey on a series of conveyors. A cutting machine chops this mega board into plasters. Of course, plasters size can be easily programmed. Sheets continue travelling down the conveying line: the first circle they move slowly, the second one goes a little faster. And then the drying process begins. The boards are conveyed on a line feeding them through a very long oven. As they enter the oven, the panels get exposed to decreasing levels of heat dropping little by little for about forty minutes. And when the process of drying is over, here comes the final stage – inspection. The finished product is thoroughly inspected by experts who estimate the quality prescribed by certain criteria. Take your targeted market into consideration because from state to state the criteria may vary, so you should definitely pay attention to these details while inspecting the gypsum plasters. North America is still a major regional market and a runway for freshmen. Even though building materials stores are overfull nowadays and it even seems that it would take some extra effort to grow business in this niche, there’s always a room for anyone. If you want to avoid too much competition, then online marketing comes in handy – statistic shows that this affordable method of growing a product turns out to be more welcoming than local marketing. It’s time to sum it all up and answer the question ‘how to start a business in drywall manufacturing’. So, as you remember, you will need a production line worth $150.000-200.000. Add extra $15.000 to pay off equipment shipping and transportation, its installation and adjustment. Moreover, additional expenses would involve rental lease. 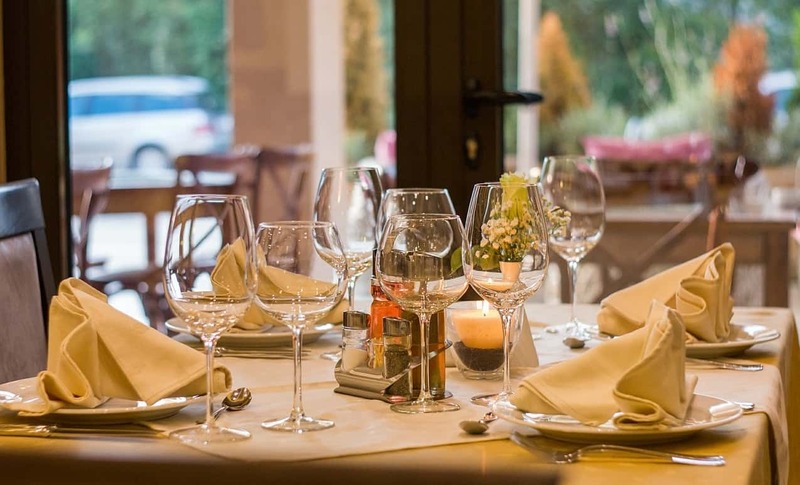 The amount you pay would depend on the total area, location and overall condition of the premises. It will take $5.000 more per 120 yd2 if you would like to redecorate them. Besides, you will have to take care of raw materials which should be sufficient for a monthly-period production. Add another $15.000 for unexpected expenses or taxes. In total, your bankroll should be around $300,000, but a few more bucks wouldn’t go amiss. The payback period for a drywall project to repay its initial investment is reasonable 1.5-2 years, but you can always generate more output.